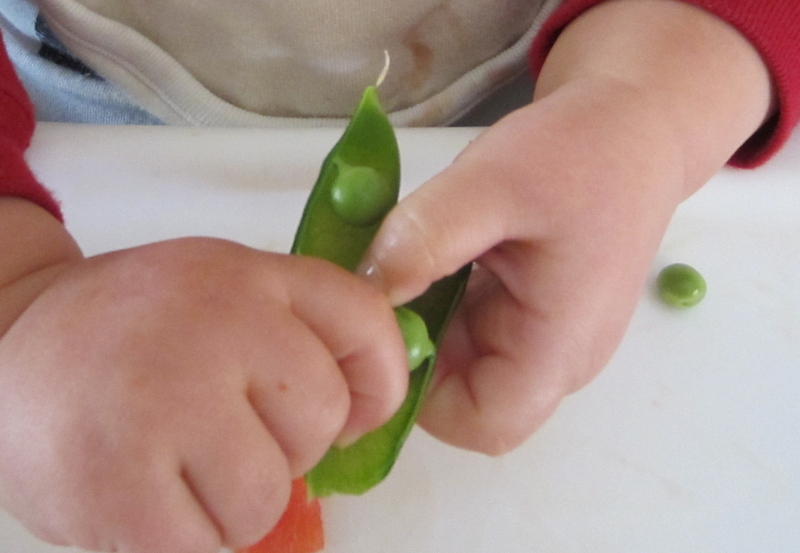 Pea pods seem to be made for small hands. Every spring I am always surprised how soon the powdery white mildew creeps up the pea vines. We have had some unusually warm days here in Southern California, and some of my vines are overcome with that sickly shade of white. Pea season is a favorite in our house, my children love them. This year I grew only shell peas, as my daughter snacks on them daily, straight off the vine. I always think I am growing a lot of peas, but then never have enough to freeze and put away for later eating. Next fall I vow to plant more. Pea season also means it is time to plan and start the summer garden. This spring is different for me as a gardener. I no longer work outside the home, nor have a newborn to take care of. I left my former job as a teacher to stay home with my two children, ages 4 and 1. Now, I have a little more time to ponder the garden and actually get my hands into the soil. I like the idea of growing enough to not have to buy produce at the grocery store or the Farmer’s Market. For a few select items, tomatoes, swiss chard, zucchini, when they are in season, this is the case. But, this year, I wanted to up the ante. I thought that if I wanted to get serious about growing a lot and having a good variety, I had to get better at starting plants from seeds. Hi Jessica — I also plant way more peas than anything else. They are all in the front yard and I think the neighbors all wonder what we could possibly do with so many peas! I think it is cool that you put some of your vegetable garden in the front yard. Your neighbors would be doing it too if they knew how good home grown peas are!